Ok campers, thanks for your patience, it’s finally time to turn that daisy-infused oil into something useful! Today we’re going to make a daisy salve for bumps & bruises. Why daisies? First of all, they’re everywhere this time of year! And they’re an vintage kitchen remedy for bruises and sprains. According to my old books, daisies are good for sprains, bruises, aches & pains. Daisies are anti-inflammatory, a wound-healer, and reduce pain. In modern life, I think this salve would be brilliant for bruises, sports injuries, sore muscles, arthritis and of course dry skin! Just please don’t apply on broken skin. This salve is for closed wounds and bruises etc. Here’s the recipe for daisy infused oil, if you haven’t made it already. Either make it following the traditional method, or put your daisies and oil in a bain marie and heat very gently for 1 hour. Then strain out the daisies. When straining out the daisies, really squeeze them to get every drop of oil out. The best way to do this is with your hands. Just get your hands in there and squeeze all the oil out! It’s fun. If you want to, you can now double-infuse your oil. This gives the oil more daisy-goodness (and therefore, more bruise-healing power). But it’s up to you. 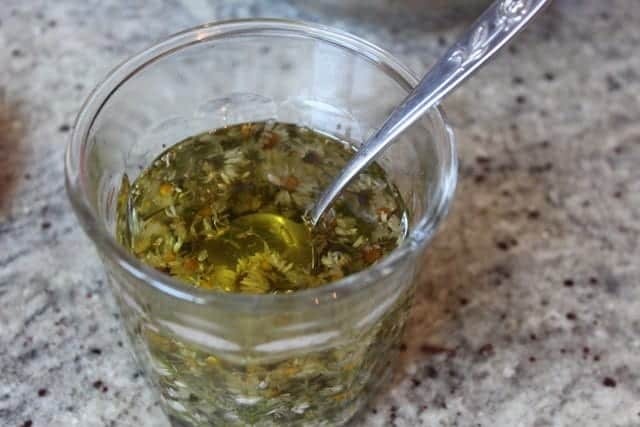 Just take the strained oil, put in a new handful of daisies, and infuse again (in the sun or in a bain marie). I decided to double-infuse my daisy oil, so I did the second infusion in a bain marie just before making the salve. 1) Measure your daisy-infused oil. 2) Math time! (Don’t run away. It’s easy, I promise.) Work out the proportions of oil and wax needed. For every 4 parts oil, you need 1 part beeswax. So, for example, if you have 1 c. of daisy oil you need 1/4c. of beeswax. I used 200ml of oil and 50 ml of beeswax. 3) In a bain marie, combine the daisy oil and beeswax. Heat gently and stir until completely melted. 4) Consistency test – We need to check how hard the finished salve will be. There’s no right or wrong answer, it’s a personal preference. It could be soft and slightly oily, or set like a lip balm, or very hard and waxy. Think about how you’ll use it. I carry mine in my handbag, so I like it to set quite firm … but so that it will still melt when I rub my finger over the salve. 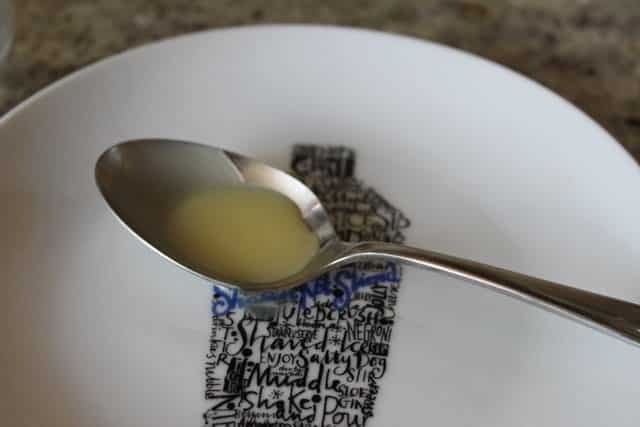 Do the consistency check by taking a small spoonful of the liquid, and placing it in the freezer for 2-3 minutes. Remove from freezer and check the consistency with your fingers. If it’s too hard, add more oil. If it’s too soft, add more beeswax. 5) Remove from heat. Add 10 drops lavender essential oil (amount for 1c. of daisy oil). 6) Pour into clean pots, and let them cool. 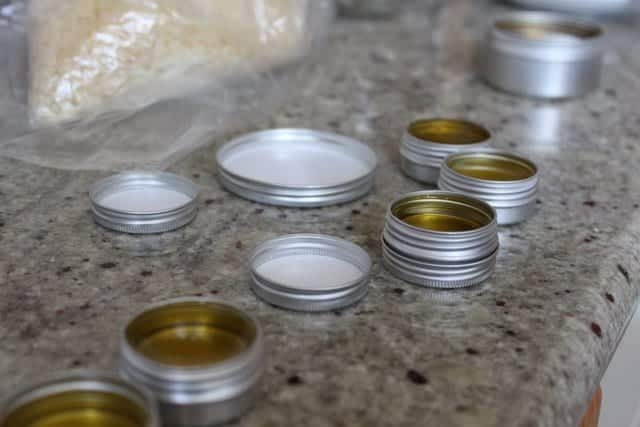 If you want a smooth surface on your salve, don’t touch the pots while they’re cooling! Once cool, cover tightly. Daisy salve should last at least one year or more. I love my daisy salve! I split mine between a bigger jar for home, and several smaller containers to keep in my handbag. I use it for everything. Just rub some onto your fingers and then onto the affected area. I use my daisy salve for bruises, sprains, sore muscles … cuticle moisturizer and sometimes a lip balm. Do not apply to broken skin. Obviously do not use if you are allergic to daisies! With any homemade product, it’s always a good idea to do a small patch test on your inner arm before using regularly. Are you making daisy salve? Tell us how it’s going in the comments or share a picture on our flickr group! First time visiting VintageAmanda? Check out some of the most popular projects here. If you want more vintagey goodness, sign up for the email list too! Previous Post: « Oatmeal Chocolate Chip Cookies… with spelt! Are the little tins aluminium, if so are they safe? What knowledge do you have about Daisy Salve being safe on babies? I must say I am enjoying the freshness of your posts. No pun intended…It’s just a nice break from health stores pushing their pre-packaged solutions all the time. We’ve recently taken up to applying for a spot at our local allotment to source our produce organically. I have used a few of Amanda’s products and I have to say Amanda really has that natural savoir-faire ! I take my daisy salve with me everywhere and applied to an “upcoming” bruise, it does keep it down and prevent it from flaring up, I experienced it a few weeks ago…I also use it as a lip salve at time and it is brilliant too, keeps my lips moisturised all day ! Just found you through Prudent Baby. This looks great. I have to check out the scoop for the Summer Camp badges-I am a little late for this year, but it sounds fun!